This book was recently licensed to The Yasuda Music Company LLC by the International Suzuki Association. 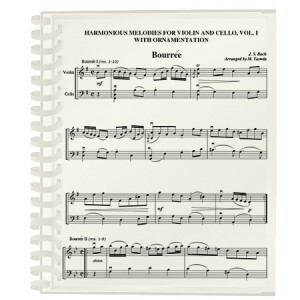 This volume contains identical titles as Harmonious Melodies, Volume I with Ornamentation For Two Violins or Violin and Viola. Get ready to enjoy an exhilarating and extra level of fun and technical challenge! The melody lines from my earlier book, Harmonious Melodies for Two Violins, Volume I, contain ornamentation (a few extra notes, trills, mordents, etc.) designed for the older student in perhaps Suzuki Book 4 and up. Since titles in this book include all pieces from Suzuki Books 1B through Book 3, younger students can play their Suzuki pieces along with the ornamented melodies in this book. Cello harmony parts are at the intermediate level and work nicely with or without ornamentation. How sweet is this — two for one?! Finally, giving your older students some extra frills to add to the simplified pieces — jazzed up recitals, here we come! Christopher Rex, Principal Cellist with the Atlanta Symphony Orchestra, kindly reviewed all the arrangements in this volume and was most gracious in writing a very supportive Foreword. Please click on Harmonious Melodies, Volume I with Ornamentation to see a complete Song List. ← Christmas Melodies For Viola: Duets Cubed…3 Verses of FUN!